In my tutorial Run a commercial paper smart contract with the IBM Blockchain VSCode extension, I showed you how to deploy and interact with a commercial paper smart contract in a scenario that tracks the lifecycle of a commercial paper. But what if you want to see the “paper” trail of all the activity that has taken place during its lifecycle — meaning an immutable history of the asset (who did what, when it took place, etc.)? To complete these tasks, you’ll use the IBM Blockchain Platform VSCode Extension, along with the new Hyperledger Fabric programming model and SDK features under the covers. There is a fantastic description of the commercial paper use case scenario in the latest Fabric Developing Applications docs, and the scenario depicted there makes for fascinating reading. In short, it’s a way for large institutions/organizations to obtain funds to meet short-term debt obligations — and a chance for investors to get a return on investment upon maturity. You will need to have completed the previous commercial paper tutorial — specifically, you should have version 0.0.1 of the commercial paper smart contract package loaded into VSCode under your “Smart Contract Packages” in the “IBM Blockchain Platform” sidebar. From the IBM Blockchain Platform sidebar panel, under the LOCAL FABRIC OPS pane, click on the ellipsis (“…”) and elect to do a “Teardown Fabric Runtime.” Answer “yes” to the prompt (in the bottom right of your VSCode panel) to destroy world state and ledger data, then await the output messages confirming that the teardown is successful. Now elect to “Start a Fabric development runtime” under “LOCAL FABRIC OPS” on the sidebar pane. Await confirmation that you have “Successfully submitted proposal to join the channel” in the output messages. From the IBM Blockchain Platform sidebar panel, install papercontract version 0.0.1 using the “Install” option under LOCAL FABRIC OPS, and select the peer offered and the smart contract version 0.0.1 as indicated. Next, choose the “Instantiate” option and select the channel “mychannel,” and papercontract version 0.0.1. In VSCode Explorer, choose File > Open Folder and select the contracts folder by navigating to the $HOME/fabric-samples/commercial-paper/organization/magnetocorp directory. The contracts folder must be your top-level project folder in VSCode. Completion of these prerequisites is the basis from which this tutorial will proceed. Next, you’ll complete the detailed transaction commercial paper history. Once the prerequisites are completed, this tutorial should take approximately 45-60 minutes to complete. Isabella, an employee of MagnetoCorp, and Balaji, an investment trader for DigiBank, should both be able to see the history (from the ledger) of a commercial paper now that it has been redeemed (some six months after it was initially issued). Luke, a developer at DigiBank, needs to add query functionality to the smart contract and provide the client apps for DigiBank so that Balaji (or Isabella) can query the ledger from the application. The upgraded smart contract should be active on the channel so the client applications can perform queries and report on the ledger history. OK — let’s get started! In VSCode, open the contract folder (if it isn’t already open), which contains the smart contract that you completed in the previous tutorial. While you’re still in papercontract.js, find the function that begins async issue (around line 70) and scroll down to the line paper.setOwner(issuer); then, in the function, create a blank/new line directly under it (which should align with the correct indentation in your code). Now paste in the following code block, which enables you to report the invoker CN of the transaction. The getInvoker function uses the clientIdentity object that’s available via the transaction context (ctx). Remember to highlight the code pastes, right-click > “Format Selection” if the pasted code is not indented correctly. Note: This code should be located before the line await ctx.paperList.addPaper(paper); in the issue function. // Use the Client Identity object to get the invoker info. Note: Once you’ve pasted this into VSCode, the ESLinter extension (if it is enabled in your VSCode session) may report problems in the Problems pane at the bottom. If it does, you can easily rectify the formatting issues in the Problems pane by choosing right-click…. then Fix all auto-fixable issues. Likewise, it will remove any trailing spaces reported by ESLint (if the line number is reported). Once you complete the formatting task, be sure to save your file via the menu. (You can use Ctrl+S to save your file.) In addition, the ESLint extension (also available from the VSCode extension marketplace) is also useful, and I recommend using it to fix any indentation, incorrect pasting, or general errors that can be detected before you package up the smart contract. You have two more small functions to add inside the source file, paper.js. Open paper.js under the lib directory in your VSCode session. Then press Ctrl+S to save the file. Create a new file via the VSCode menu under the contract/lib folder using VSCode and call it query.js. Copy the contents of the query.js file from the GitHub repo github.com/mahoney1/commpaper, which you cloned earlier. Now let’s get this added smart contract functionality out on the blockchain to replace the older smart contract edition. Change the version to 0.0.2. Press Ctrl+S to save it. Click on the source control sidebar icon and click the tick icon to commit, with a message of “adding queries,” and press Enter. Now you’re ready to upgrade your smart contract using the VSCode extension. Package the contract: Click on the IBM Blockchain Platform sidebar icon and under “Smart Contract Packages,” choose the “Package a Smart Contract” icon (“+”); you should see that version 0.0.2 becomes the latest edition of the available “papercontract” packages. Under the Local Fabric Ops panel in the IBM Blockchain Platform sidebar, expand the instantiated contract “papercontract” and highlight it. Right-click on papercontract@0.0.1 — Upgrade Smart Contract, and choose papercontract@0.0.2 from the list presented (up top) — then select the peer offered at the top. Enter or paste the text org.papernet.commercialpaper:instantiate when prompted to enter “a function name to call,” then press Enter. When prompted to enter any arguments, just use Enter. You should get a message in the console that the upgrade is taking place. It will take a minute or so (as it has to build the new smart contract container), and when it has completed you should see a “successful” pop-up message. If you check it using docker ps from a terminal, you should see a new Docker container with the contract version as a suffix under the “Names” column. In VSCode, click on the menu option File … open Folder, open the folder under organization/digibank/application, and press Enter. Right-click on the folder in the left pane and create a new file named queryapp.js. Then paste the contents of the other file named queryapp.js, which is located in the commpaper repo that you cloned previously (see steps in the “Summary” section of the previous Commercial Paper tutorial. Now you can fix any formatting errors if ESLint is enabled (right-click on “Fix all auto-fixable errors,” and it should automatically fix any indentation issues). Buy the paper as “DigiBank,” the new owner. Buy the paper as “Hedgematic,” the changed owner. Redeem the paper at face value, as existing owner “Hedgematic,” with MagnetoCorp as the original issuer. Export the connection details (connection.json) from the IBM Blockchain Platform VSCode extension panel. 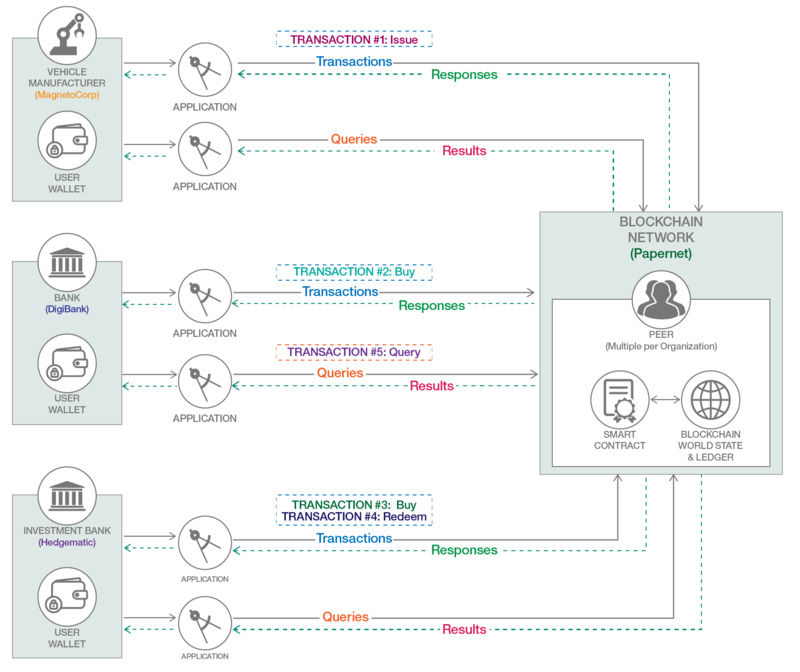 From the IBM Blockchain Platform extension sidebar, locate the development peer under “Nodes” in the sidebar pane LOCAL FABRIC OPs on the left. Right-click on the peer and select “Export Connection Details.” The export location creates a “local_fabric” subdirectory under the contract folder of your smart contract workspace (such as $HOME/fabric-samples/commercial-paper/organization/magnetocorp/contract/local_fabric/), where $HOME is “/home/user1” in this example — but should be different for you. Below this line, add the following 2 lines of code. And that’s all of the changes for the “issue” client. Next, change the “buy.js” and “redeem.js” client scripts in exactly the same way — so complete step 5 above for each of the “buy.js” and “redeem.js” scripts so that each reads the local_fabric connection.json file path as shown. This will unzip the user Bart’s wallet into a subdirectory under /tmp/wallet. After this extraction, you will have a directory named /tmp/wallet/bart@hedgematic that contains Bart@Hedgematic’s identity wallet. The time has come in this commercial paper’s lifecycle for the commercial paper to be redeemed by its current owner (Hedgematic) at face value, so it recoups its investment outlay. A client application named redeem.js performs this task, and it needs to use bart@hedgematic’s identity from owner Hegematic to perform it. (Currently, the redeem.js sample script uses balaji‘s identity, but because Hedgematic has since bought the paper from DigiBank, you need to modify the script to redeem it properly as Hedgematic’s Bart.) For the purposes of this tutorial, you just need to run the client application script for redeem from the digibank application subdirectory. Once again, from a terminal window and the same directory, $HOME/fabric-samples/commercial-paper/organization/digibank/application, edit the file redeem.js. Note: If you prefer, you can issue your own identity using the currently active CA server, using the Fabric-CA utilities or APIs, and change this script as appropriate. Then save your file and commit any changes. From a terminal window, change the directory to the $HOME/fabric-samples/commercial-paper/organization/digibank/application folder. You should see the JSON results from both the queryHist and queryOwner functions in the terminal window. It also creates a file called results.json in the current directory (history of the asset) as a result of the queryHist query invocation. For this step, you use a simple Tabulator that renders your results in an HTML table. You don’t have to install any code or client per se, nor use jQuery — you just need to use a simple HTML file that uses online CSS formatting and performs a local XMLHttpRequest() GET REST API call to load the local results (from the JSON file, avoiding CORS issues) and render it in the table. That index.html file comes from the “commpaper” Github repo cloned previously; please take some time to peruse the HTML file. In a terminal window, open the DigiBank application directory once again (you should already be there). If you examine the HTML file in VSCode Explorer, you’ll see that it performs a REST /GET API call and loads a results file called results.json (created by the queries app invoked earlier) and renders these in a table in a browser. The results.json file contains the query results. You should see the results in tabular form in the browser; expand or contract column widths as necessary, such as longer columns like Txn ID. Note that TxId here is the Fabric transaction ID. The Invoking ID is the invoker Common Name, which is extracted using the Client Identity library mentioned earlier. Obviously, this would need to be made available as an attribute by any of the organizations that execute transactions using this shared smart contract. As an alternative, a hash of the signer certificate can be used. Well done! You’ve now managed to successfully add query functionality to the commercial paper sample smart contract using the IBM Blockchain Platform VSCode extension. 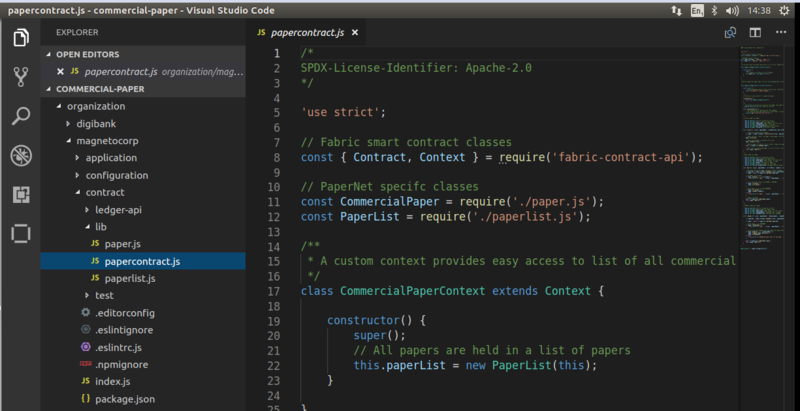 This tutorial showed you how to add queries and upgrade your existing commercial paper contract using the IBM Blockchain Platform VSCode extension and use features from Hyperledger Fabric’s new programming model. Take time to peruse the transaction (query) functions in both papercontract.js and the query class file query.js under the lib directory. And be sure to peruse the client application, queryapp.js. You’ve learned how to render the history results (the history of a commercial paper asset) in a simple browser-based HTML application. The final tutorial in this series will show only changes during the lifecycle. As a last step, it is good practice to close out your current folders in VSCode, in preparation for the next tutorial. The third and final tutorial in this series will show you how to add smart contract functionality to query only the deltas for the history of a particular asset. Until then, thanks for joining me! Deploy a sample commercial paper smart contract to the Hyperledger Fabric blockchain using the VSCode extension, and then run it. 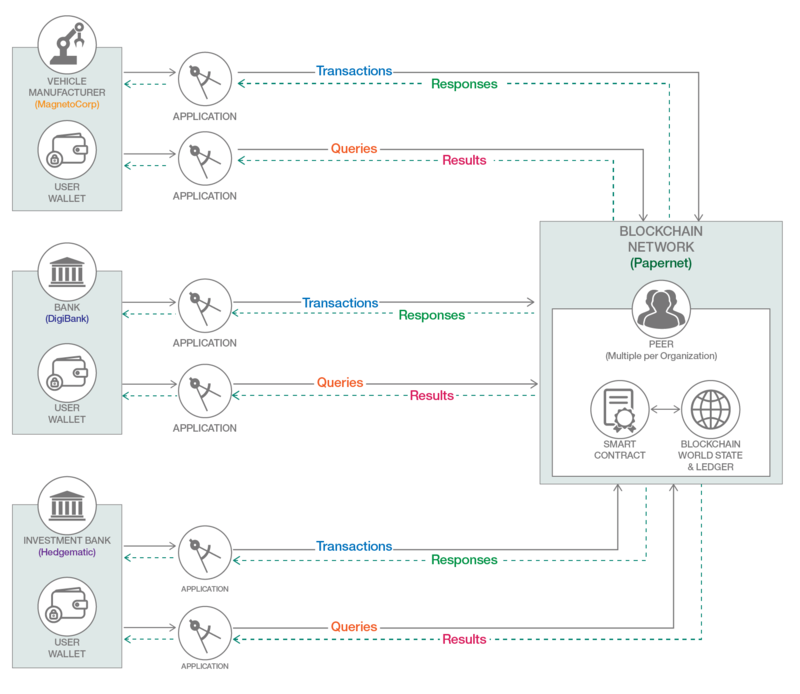 This supply chain use case illustrates how you can get the most out of your smart contracts.